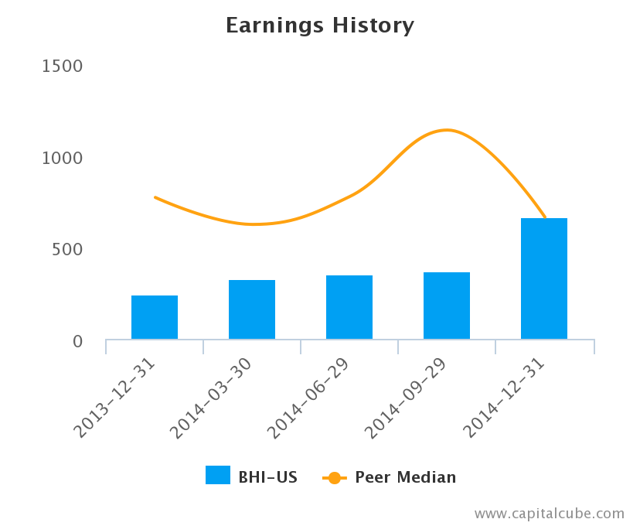 Baker Hughes Incorporated (NYSE:BHI), which will be acquired by Halliburton later this year, reported record revenue of $6.6 B in Q4 2014, up 6 percent compared to Q4 of 2013. It also announced $663 million in net earnings, exceeding Wall Street expectations. The company is a global supplier of oilfield services, products, systems, and technology to the oil & natural gas industry, and a provider of industrial products to the chemical and energy industry. It operates in more than 80 countries, with the North American division leading revenue growth. This earnings release follows the earnings announcements from the following peers of Baker Hughes Incorporated – Halliburton Company (NYSE:HAL) and Schlumberger NV (NYSE:SLB). See also our analysis of Halliburton Company and Schlumberger NV. Summary numbers: Revenues of $6.64 B; Net Earnings of $663 million; and Earnings per Share (EPS) of $1.52. Gross margins widened from 20.9 percent to 29.1 percent compared to the same quarter last year; operating (EBITDA) margins are now 22.4 percent from 15.2 percent. Change in operating cash flow of 19.6 percent year-over-year trailed the change in earnings. 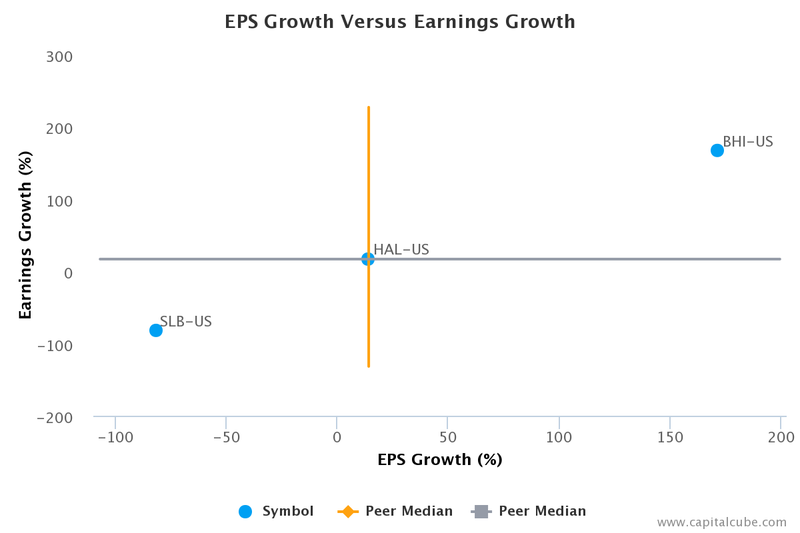 Earnings potentially benefiting from some unlocking of accruals. 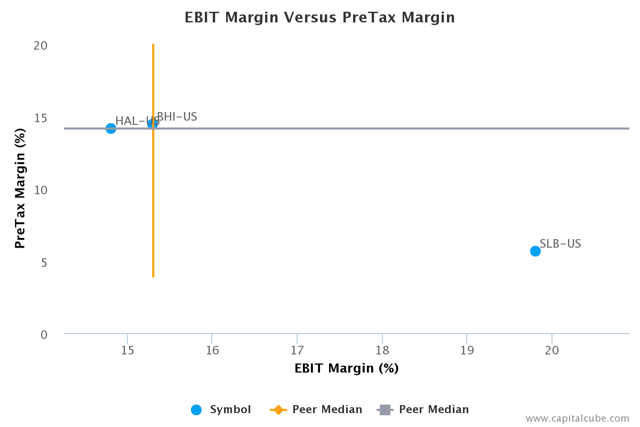 Earnings growth from operating margin improvements, as well as one-time items. There is sometimes a tension in companies’ performance between a focus on market share and a focus on profit or earnings growth. Compared to the same quarter last year, Baker Hughes’ change in revenue trailed its earnings performance, which, at $663 million, was more than double the earnings from the same quarter last year. The company’s performance this period suggests a focus on boosting bottom-line earnings. 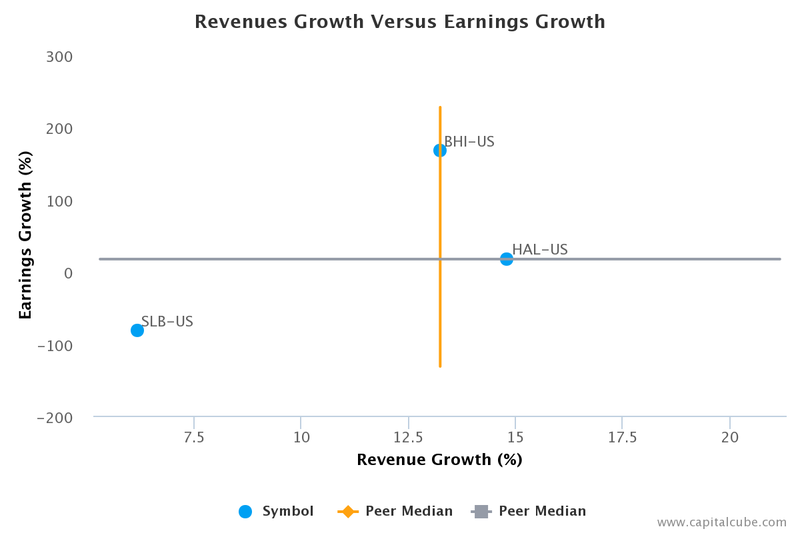 While the revenue performance could be better, it is important to note that the quarterly change in revenue was second only to Halliburton among its peers thus far. Also, for comparison purposes, revenue changed by 6.2 percent and earnings by 76.8 percent compared to the immediate last quarter. The company’s earnings growth was influenced by year-on-year improvement in gross margins from 20.9 percent to 29.1 percent, as well as better cost controls. 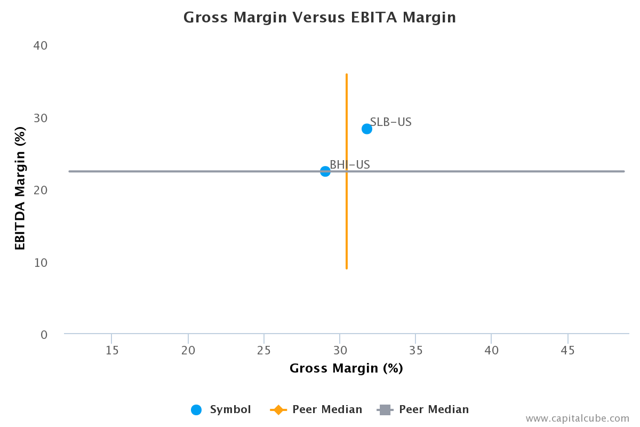 As a result, the operating margins (EBITDA margins) rose from 15.2 percent to 22.4 percent compared to Q4 of 2013. 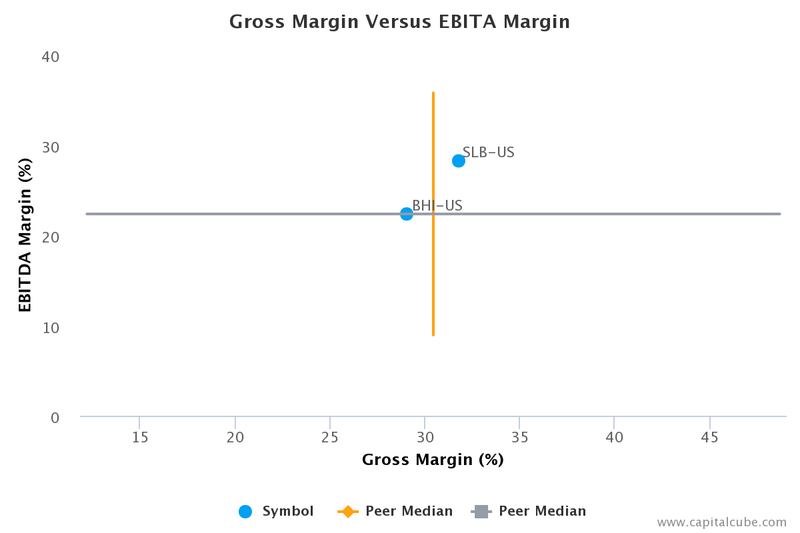 For comparison, gross margins were 26.1 percent and EBITDA margins were 19.0 percent in Q3 of 2014. Companies sometimes sacrifice improvements in revenues and margins in order to extend friendlier terms to customers and vendors. 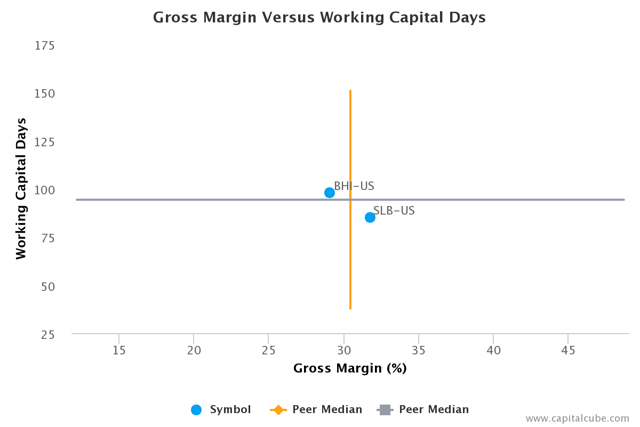 CapitalCube assesses such activity by comparing the changes in gross margins with any changes in working capital. If the gross margins improved without a worsening of working capital, it is possible that the company’s performance is a result of truly delivering in the marketplace and not simply an accounting prop-up using the balance sheet. Baker Hughes’ improvement in gross margin has been accompanied by an improvement in its balance sheet as well. This suggests that gross margin improvements are likely from operating decisions and not accounting gimmicks. Its working capital days have declined to 97.8 days from 105.0 days for the same period last year. Baker Hughes’ year-on-year change in operating cash flow of 19.6 percent trailed its change in earnings. This leads CapitalCube to question whether the earnings number might have been achieved from some unlocking of accruals. 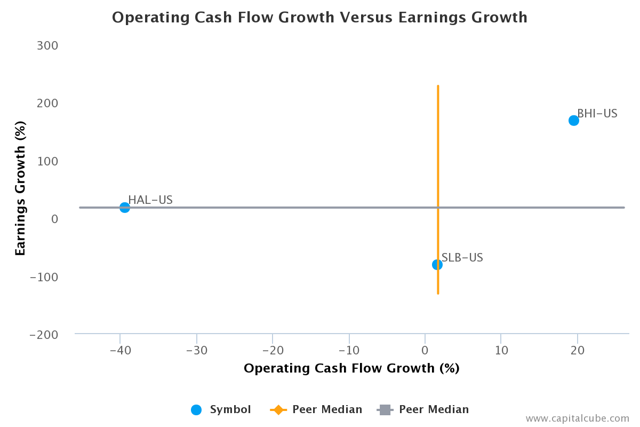 In addition, the increase in operating cash flow was less than the average announced thus far by its peer group. The company’s earnings growth has also been influenced by the following factors: (1) Improvements in operating (EBIT) margins from 7.7 percent to 15.3 percent, and (2) One-time items. The company’s pretax margins are now 14.4 percent, compared to 7.2 percent for the same quarter last year. Baker Hughes’ change in Earnings per Share (EPS) of 171.4 percent year-over-year is better than its change in earnings of 167.3 percent. 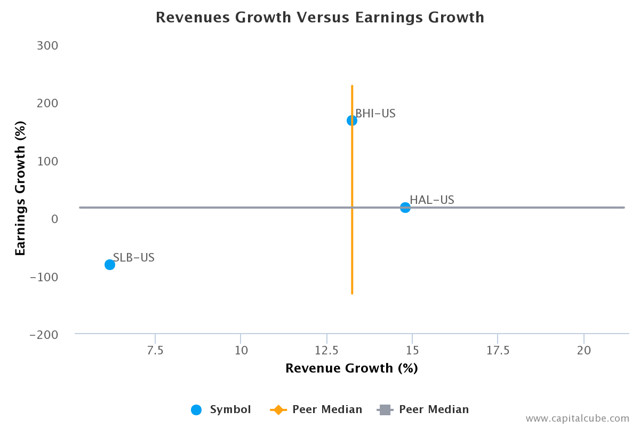 However, the change in earnings is better than the peer average among the results announced to-date, suggesting that the company is gaining ground in generating profits from its competitors.